"Kingsolver is a gifted magician of words." The extraordinary New York Times bestselling author of The Lacuna (winner of the Orange Prize), The Poisonwood Bible (nominated for the Pulitzer Prize), and Animal, Vegetable, Miracle, Barbara Kingsolver returns with a truly stunning and unforgettable work. Flight Behavior is a brilliant and suspenseful novel set in present day Appalachia; a breathtaking parable of catastrophe and denial that explores how the complexities we inevitably encounter in life lead us to believe in our particular chosen truths. Kingsolver's riveting story concerns a young wife and mother on a failing farm in rural Tennessee who experiences something she cannot explain, and how her discovery energizes various competing factions—religious leaders, climate scientists, environmentalists, politicians—trapping her in the center of the conflict and ultimately opening up her world. 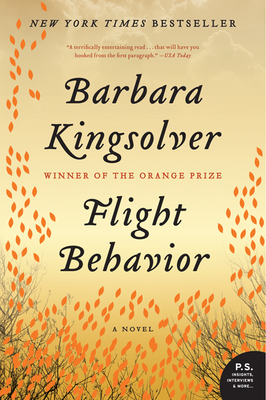 Flight Behavior is arguably Kingsolver's must thrilling and accessible novel to date, and like so many other of her acclaimed works, represents contemporary American fiction at its finest.